3-mile roundtrip hike to Utah State icon (featured in stamps, on Utah's license plate), a 65-foot-tall freestanding natural arch. This will not be a solitary experience but it is a perfect way to finish off a day of other activities and take in a sunset. There is a reason Delicate Arch is on the Utah State license plate and on lots of Utah’s advertising information. It is worth the 1.5 mile hike, no matter the crowds. It is tradition at sunset that the mayhem calms down and no one goes near the Arch so everyone has a chance to photograph it as the last rays of sun hit it. It is also tradition that everyone is silent at that moment. Full moons, headlamps, warm coats and patience are recommended if you are comfortable with hiking and exposure at night. This place is magical. Note that many people are rescued off this trail for underestimating the heat and not bringing water. Know your limits and prepare accordingly. Arches National Park is 119.8 square miles of pretty. It’s a playground of pretty. Plan for gawkers and bad driving, as the beauty of the area is that breathtaking. Remember that everyone there is the same as you, explores of the outdoors, seekers of the intoxication of beauty. Talk to them, they each have a story of why they are there and seeing it through their eyes may be the touching memory that stays with you for the rest of your life. The entrance to Arches National Park is on route 191 five miles north of Moab. The first mile into the park is a breathtaking engineering feat worthy of awe. 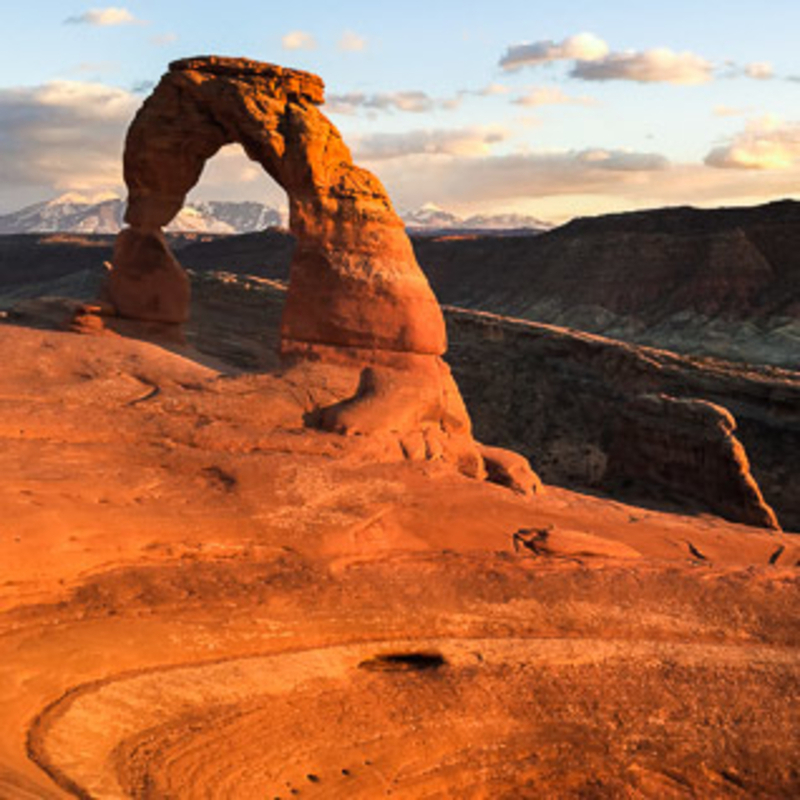 The fee to for Arches National Park is currently $10 per vehicle. On the Park’s website is a list of free days including Martin Luther King Jr. Day, Veteran’s Day and Washington’s Birthday weekend (expect wedding proposals at the Arch this weekend if it coincides with Valentine’s Day). 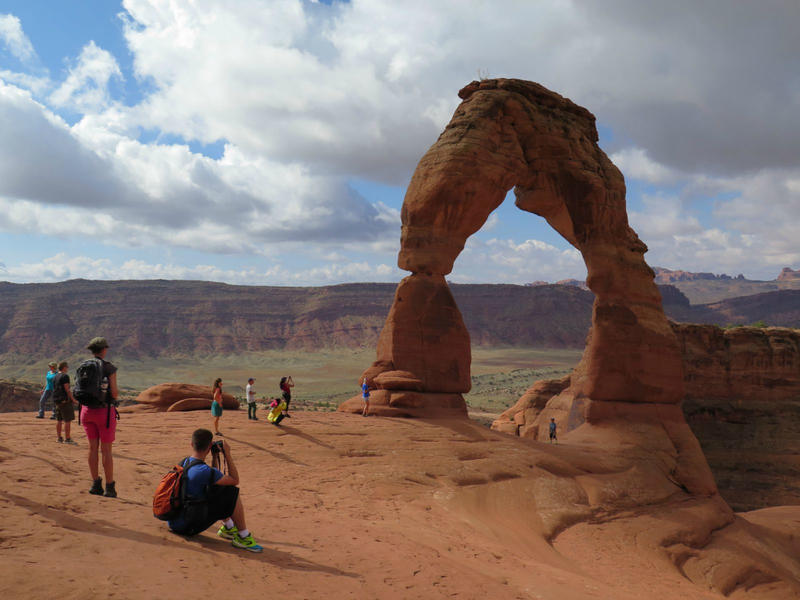 Hikers will not be disappointed by the stunning views of Delicate Arch. Even with the crowds, this place is worth checking out. From the entrance of the park, drive 11.7 miles north. Take a right following the signs for Delicate Arch – Wolfe Ranch. The parking lot and trailhead are 1.2 miles from this junction. The trail is often crowded. Make the short detour following the signs to see the Petroglyphs and learn about the history of Wolfe Ranch. From there the hike ascends a well-marked wide trail that transitions to a steeper slick rock section, this is the steepest section of the trail, be careful if it is wet. After that, the trails winds a bit up, but is mostly flat. The views of the geological transitions along the way are worth a moment to reflect on. After the weaving section through traditional desert landscape of rocks, juniper and pinyon you will ascend steps and a short trail carved into the sandstone. 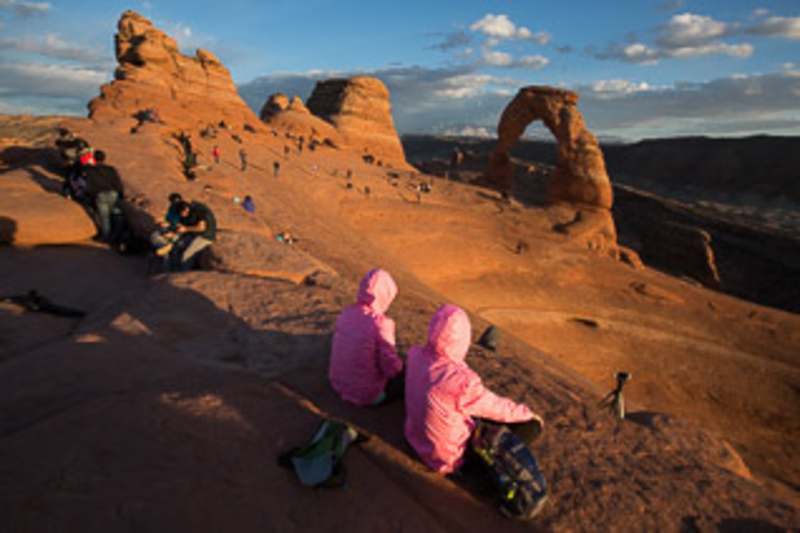 If you have a fear of heights, you can hug the wall, or chose to turn around, it is about 100 yards until you pass under Frame Arch to reach the amphitheater and see Delicate Arch and its sweeping views. The La Sal Mountains form a lovely backdrop to the red slick rock as they usually had a bit of snow on them. Arches National Park, as all National Parks have strict dog policies. No dogs are allowed on this trail. You are also not able to leave dogs in cars at the trailhead.